本发明涉及一种在线社会网络的网页搜索方法，以及一种网页搜索系统。 The present invention relates to an online social network web search method, and a web search system. 在用户访问在线社会网络时，在线社会网络搜索所有该用户的朋友推荐给该用户的网页；对上述搜索到的各网页，在线社会网络提取该朋友转发该网页至该用户当前访问的时间间隔、被转发的次数和该用户已转发该朋友推荐网页的数量；在线社会网络根据各网页的上述时间间隔、被转发的次数和该用户已转发该朋友推荐网页的数量作为参数对各网页进行排序；在线社会网络按照上述排序向用户返回全部或部分搜索结果。 When a user accesses online social networks, online social networks to search for all of the user's friend to the user's page; each page above the search to the online social network extraction time the friend forwards the page to the user's current access interval, the number of forwarded and the user has forwarded the friend page number; online social networks interval from the time of each page, the number of forwarded and the user has forwarded the friend page number as a parameter to sort each page; online social networks to return all or part of the search results to the user in accordance with the above order. 本发明计算开销低，不依赖用户提供搜索关键词，不需要爬取网页，满足个性化的需求，有效避免信息过载等问题。 Calculation of the present invention is low cost, does not rely on the user to provide a search keyword, crawling pages need not meet the individual needs, avoid information overload problem. 本发明属于网络信息搜索领域，涉及一种网页搜索方法，尤其涉及一种在线社会网络的网页搜索方法，以及系统。  The present invention belongs to the field of information search network, to a web search method, particularly to an online social networking Web search methods, and systems. 个人生活的网络化成为当前的社会趋势，人们的生活越来越离不开网络。 Network  personal life becomes the current social trend, people's lives become increasingly dependent on networks. 数以亿计的人们使用在线社会网络=Facebook拥有8亿注册用户，新浪微博的注册用户高达2亿，Twitter和人人网的注册用户数也超过I亿。 Hundreds of millions of people use online social networks = Facebook has 800 million registered users, Sina microblogging registered users up to 200 million registered users of Twitter and all networks are also more than I million. 作为一种新兴的传播媒介，在线社会网络改变了传统信息发布、扩散的方式。 As an emerging media, online social networking has changed the traditional information dissemination, diffusion ways. 人们主动和其它用户结为朋友，并且实时地收到朋友推荐的内容。 People take the initiative and other users became friends, and receive recommendations from friends content in real time. 信息借助分享、推荐等方式扩散到广泛的用户，却几乎不需要什么成本。 With information sharing, diffusion and recommend ways to a wide range of users, but almost do not need any cost. 在线社会网络已成为交流沟通、共享信息和组织活动的重要平台。 Online social networking has become communicate, share information and organizational activities of important platform. 随着大量用户的加入和海量信息的发布，在线社会网络面临信息过载的问题。  With the release of a large number of users to join and massive information, online social networks face the problem of information overload. 朋友分享的网页都自动推送到用户的新鲜事。 Friends sharing pages are automatically pushed to the user's new. 随着朋友数量的增长，用户收到的网页日益增多。 With the growing number of friends, pages that users receive increasing. 如图1所示，在人人网中，500个朋友的用户总共收到朋友推荐的13万网页，1000个朋友的用户总共收到朋友推荐的23万网页。 As shown in Figure 1, in all networks, a total of 500 users received a friend of a friend recommended 130 000 pages, 1000 a friend of a friend of a user received a total of 230,000 pages. 这些网页包含丰富的内容，比如日志、照片、视频等。 These pages contain a wealth of content, such as logs, photos, videos and so on. 面对大量信息，用户难以筛选出感兴趣的内容。 Face a lot of information, the user is difficult to filter out content of interest. 需要一种高效的网页搜索方法，帮助用户搜索用户关注的网页。 Need for an efficient method of Web Search to help users search for web users attention. 中国发明专利申请“一种网页排序方法及装置”(公开号:CN 101079064A)提供了一种网页排序方法，存储用户确立的网页类别向量；将用户访问的IP日志进行分类，根据用户访问最多的IP类别确定用户的专家类别；当用户根据搜索引擎检索结果点击网页时，按照确定的用户的专家类别对该网页对应的网页类别向量的值加分；当用户通过搜索引擎输入索引进行信息检索时，参照网页的网页类别向量对搜索的网页进行优化排序。  Chinese Patent Application "an page sorting method and apparatus" (publication number: CN 101079064A) PageRank invention provides a method of storing page categories established by the user vector; IP accessed by the user logs classified, according to user most visited categories determine the user's IP expert category; when the user clicks on the page, according to the expert category to determine the value of the user points to the web page vector category corresponding to the search results based on search engine; when a user input via a search engine index when information retrieval, web pages referring to the category of vector web search optimized sorting. 其目的是解决现有技术中直接靠用户的点击次数对网页进行加分而导致用户恶意点击，加分推荐非常盲目的问题。 The aim is to solve the problem that depend directly on the user clicks on the web page points caused by the user malicious clicks, plus highly recommend blindly problem. 但在在线社会网络中，用户无需输入任何关键词，就需要收到朋友推荐的网页。  However, in an online social network, users need to enter any keyword, you need to receive recommendations from friends page. 第二，上述技术还是以用户对网页的实际访问为基础，而在在线社会网络中，用户收到的网页都来源于朋友的推荐，上述方法显然不适用。 Second, the techniques described above or to the actual user access to web-based, and online social networks, web users have received from a friend's recommendation, the above method obviously does not apply. 中国发明专利申请“基于用户关注时间的网页文本与图象排序方法”(公开号:CN101320387A)公开的方法包括利用关注时间结合传统搜索技术生成个性化的网页和图片排序，为用户提供更好的个性化服务。  Chinese patent application "web page based on a user's attention time text and image sorting method" (Publication number: CN101320387A) disclosed method includes generating a personalized attention time pages and images sorted combining traditional search techniques, to provide users with more personalized service. 该方法所述的关注时间是用户在浏览一个网页或图片时花费的阅读或浏览时间，其中一个关键步骤是基于文本和图片相似度来预测未知网页的关注时间。 The method of the attention time is spent by users when browsing a web page or image reading or viewing time, which is a key step based on the similarity of text and pictures to predict the unknown pages of time attention. 但在在线社会网络中，难以爬取网页内容，可能无法对网页内容进行分析。  However, in an online social network, it is difficult crawling web content, may not be able to analyze the page content. 如Facebook和人人网等以实名制为基础，保护用户隐私。 Such as Facebook and all net-based real-name system to protect user privacy. 在在线社会网络中，很多网页有专门的权限，只允许特定的人浏览，不能随意爬取网页内容，自然也就无从象百度等搜索引擎一样爬取网页内容，然后进行分析。 In online social networks, many pages have special permission to allow only specific people browse and can not crawl Web content, there can be no natural like Baidu and other search engines crawling web content, and then analyzed. 中国发明专利申请“基于内容引用的网页搜索结果排序方法”(公开号:CN101526956A)公开的方法先针对各类用户的各类查询词获取各类网页的网页全集，再经过正文提取、文本分块、引用列表建立的步骤得到该网页全集内各文本块的所有引用列表，再通过网页排名计算，得到引用最多的50个文本块作为引用黑名单，然后当同一用户输入查询词时，把该引用黑名单作为引用列表建立时的文本块索引表，利用表内的网页列表，作为网页排名计算时的参照物得到对包含用户查询词的所有网页排序。  Chinese invention patent application "Web search results to sort the contents of references based on": the method disclosed first obtain various types of web pages Complete Works (Publication No. CN101526956A) for all types of query words all types of users, and then after the text extraction, text block, steps to establish a list of references to get all the various blocks of text within the page Complete list of references, and then calculated by page rank, get the most cited 50 block of text as a reference the blacklist, and then when the same user enters a query term, the reference to the blacklist as a quoted text block index table when the list is established, using the list of pages in the table as a reference when calculating page rank get all sort pages that contain user query terms. 如上所述，在线社会网络不需要输入关键词，也无法爬取网页内容进行分析，因此该方法也无法应用于在线社会网络。  As mentioned above, online social networks do not need to enter keywords, can not crawl the page content analysis, this method can not be applied to online social networks. 另外，在在线社会网络中，当用户登录后，在线社会网络立刻提供网页排序后的搜索结果。 Search results after the  In addition, online social networks, when users log in, the online social network provides web ordering immediately. 要求搜索方法的时间开销低，短时间内返回结果。 Search method requires low time cost, short time to return results. 上述现有技术的方法因为计算量大，难以达到在线社会网络的要求。 Method  The prior art because the calculation amount, it is difficult to meet the requirements of an online social network. 本发明的目的在于提供一种在线社会网络的网页搜索方法，满足低开销、不依赖搜索关键词、不爬取网页内容的要求。  The object of the present invention to provide a web search method of online social networks where low cost, does not rely on keyword searches are not required to take crawled web content. 本发明的另一目的在于提供一种在线社会网络的网页搜索系统。  Another object of the present invention is to provide an online social network web search system. 4、在线社会网络按照上述排序向用户返回全部或部分搜索结果。  4, online social networks to return all or part of the search results to the user in accordance with the above order. 本发明根据上述时间间隔、流行度和该用户已转发该朋友推荐网页的数量分别对各网页评分，得到各网页的综合分数，按照综合分数对各网页进行排序。  The present invention is based on the time interval, the popularity and the number of users has been forwarded friend page for each page are rated to give a composite score for each page, each page in accordance with the sort of composite score. =O,当(c-tik)/86400 > 30 ;其中，C表示当前访问时间，tik表示朋友i转发网页k时间。 = O, when (c-tik) / 86400> 30; wherein, C represents the current access time, tik denotes time friend i k forwards the page. 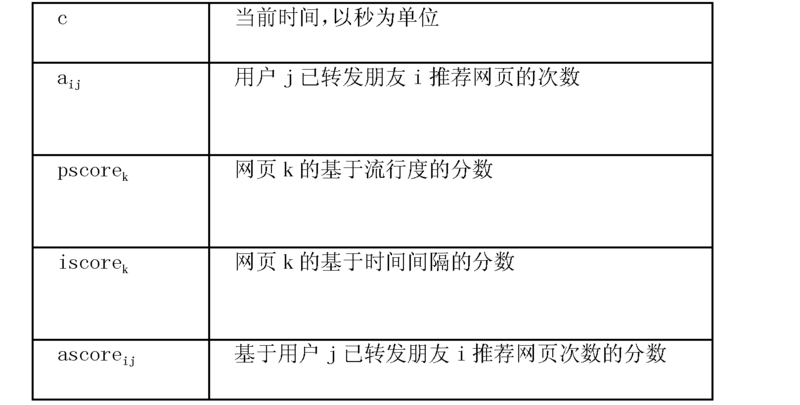 pscorek = 1gltl (pk),其中，pk表示网页k被转发次数。  pscorek = 1gltl (pk), where, pk represents the k is forwarded page number. ascore^- = 55.63+2.其中au表示该用户j已转发该朋友i推荐网页的数量。  ascore ^ - = 55.63 + 2 where j au represents the number of users of the web has been recommended by a friend i forwarded. 所述服务器设一网页排序模块，根据上述网页的综合分数对各网页进行排序；[0031 ] 所述服务器按照网页排序全部或部分将搜索结果返还所述用户终端。  The web server is provided a sorting module to sort a composite score for each page according to the above-described page; the  server according to the user terminal returning all or part of the page ordering search results. 所述数据库在产生新网页时插入该网页的记录，将该网页的流行度设置为1，每当该网页被转发时，数据库更新该网页的记录，将流行度加I ;在用户创建新的朋友关系时插入该朋友的记录，并将已转发该朋友推荐网页的数量设置为0，每当用户转发该朋友推荐的网页时，将已转发该朋友推荐网页的数量加I。  When the database is inserted in a new record of the web page, provided the popularity of a web page, whenever the page is forwarded to update the database records of the web page, popularity will increase I; user insert the record number of a friend of a friend when you create a new relationship, a friend and was forwarded to the page number is set to 0, whenever the user forwards the pages recommended by a friend, the friend recommendation was forwarded to the web page plus I. 为了提供本发明的网页搜索方法，首先分析了用户行为，找到决定用户关注的属性及相应的参数。  In order to provide web search methods of the present invention, the first analyzes of user behavior, property and find the corresponding parameter determines the user's attention. 从收到的网页中，用户浏览部分网页，然后转发有趣的网页，推荐给更多的人。 I received from a Web page, the user browsing some pages, and then forwards the interesting pages and recommend it to more people. 通过分析用户转发的网页，可以发现影响用户行为的因素。 By analyzing the forwarding user pages, you can find factors that influence user behavior. 本发明考虑网页自身、时间、朋友和发布者等多方面的属性，如表I所示显示了各属性对用户行为的影响。  The present invention contemplates the page itself, time, friends and publishers, and many other properties as shown in Table I shows the effect of each attribute on the user behavior shown in FIG. 本发明发现代表用户关注度的属性是:网页的流行度、转发间隔时间和已转发该朋友推荐网页的数量。 The present inventors have found that the properties on behalf of a user's attention is: popularity of pages, forwarding interval and the number of the friend webpage has been forwarded. 本发明选择这三个属性，作为搜索参数。 The present invention selects these three attributes, as a search parameter. 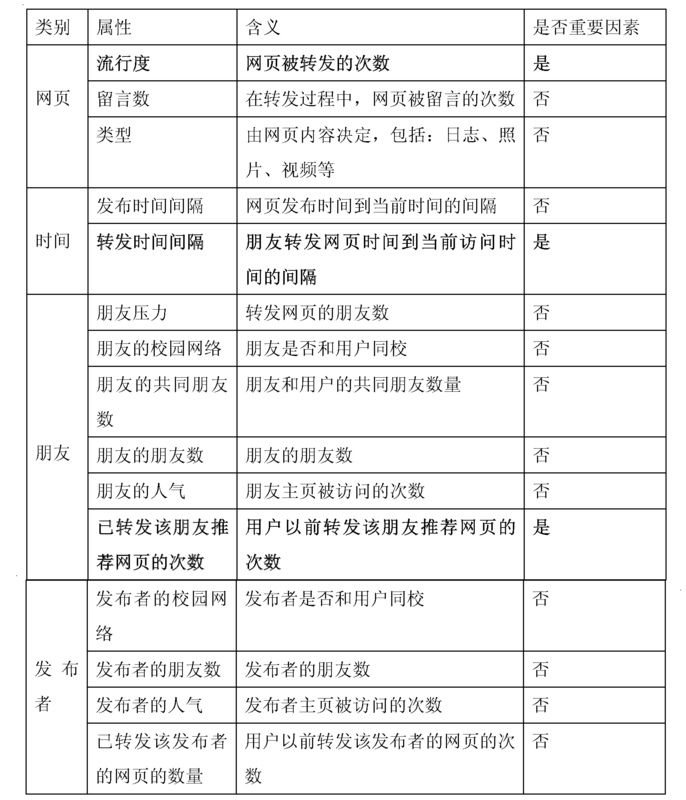 为了确定这些属性的用法和参数，首先定义各符号，详见表2。  In order to determine these parameters and usage properties, the first definition of each symbol, as shown in Table 2. 本发明发现转发间隔时间是重要因素。  The present inventors have found that repeating interval time is an important factor. 对于用户实际采纳、转发的网页，本发明计算朋友推荐网页时间到用户访问网页时间的间隔。 For the actual user adoption, forwarding pages, the present invention is to calculate the time a friend recommended to web pages users access time interval. 如图2所示，横轴是该转发时间间隔，纵轴是该间隔对应的实际访问的网页比例。 As shown in FIG 2, the horizontal axis represents the forward time interval, and the vertical axis is the ratio of the interval corresponding to the page actually accessed. 本发明用公式I = 14.74*e(_°_2*(x_2_5))进行拟合。 The present invention is fitted by the formula I = 14.74 * e (_ ° _2 * (x_2_5)). 此外，图2显示转发时间间隔大约30天的网页几乎没有。 In addition, Figure 2 shows the Web page forwarding time interval of about 30 days little. 图2的横轴是以天为度量单位，而当前时间、朋友推荐时间等以秒为度量单位，所以需要除以86400(1天=86400秒)进行转换。 The horizontal axis  FIG. 2 is a unit of measurement days, and the current time, friend time is measured in units of seconds, it is divided by 86,400 (1 day = 86400 seconds) conversion. 如图3所示，本发明发现用户转发朋友的网页数量越多，那么用户和该朋友的关注点越相近，今后越可能再次转发该朋友推荐的网页。  As shown in Figure 3, the present inventors have found that the more the number of pages a user forwards a friend, then the more similar users and friends of the concern, in the future more likely to forward the recommendation of a friend page again. 图3详细度量了两者间的关系，并用公式y = 55.63+2.92x进行拟合。 FIG 3 details the relationship between the two measures, and using the formula y = 55.63 + 2.92x fit. 然后按照综合分数对网页进行排序，按照事先设定，如设定网页显示量为综合分数为前100的网页，向用户返回全部或部分搜索结果。  Then, in integrated score sorting the web pages, according to previously set, such as the settings page display as a composite score, return all or part of the page before the search result 100 to the user. 本发明分析了影响用户行为的因素，提出了在线社会网络的网页搜索方法，考虑了网页流行度、转发时间间隔、已转发该朋友推荐网页数量等多个特征，可以帮助用户找到关注的网页内容。  The present invention analyzes the factors that influence user behavior, web search method proposed online social networks, given the popularity of the page, forwarding time interval, was forwarded to the friend recommended multiple features such as page number, it can help users find focus web content. 4、用户收到的网页都来源于朋友的推荐，用户的朋友不同，其收到的网页就不同。  4, pages that users receive are derived from the recommendation of friends, friends of different users, web pages it receives is different. 实现了向每个用户提供特定的网页排序结果，满足个性化的需求。 Achieve a Page Rank results provide specific to each user, to meet individual needs. 图5本发明系统结构框图。  Block diagram of the inventive system 5. 如图5所示，本发明的在线社会网络的网页搜索系统，包括至少一个带搜索引擎的在线社会网络服务器，若干用户终端，各用户终端与所述服务器通过网络连接，所述服务器通过搜索引擎在一用户通过一用户终端访问在线社会网络时搜索该用户朋友转发给该客户的所有网页；所述服务器内设或连接一个或多个数据库。  5, online social networks of the present invention, web search system, comprising at least one of an online social network server with a search engine, a plurality of user terminals, each user terminal and the server via a network connection, said server the server is equipped with or connected to one or more databases; search engine users to search all the pages in a friend forwarded to the user to access the customer's online social network through a user terminal. 在本实施方式中，在线社会网络维护一网页流行度数据库(表示为，〈网页，流行度〉数据库，记录该网页被转发次数，维护一已转发朋友推荐网页的次数的数据库，(表示为〈用户，朋友，已转发朋友推荐网页的次数〉的数据库)，在线社会网络还提取各网页被一用户的朋友转发该用户至该用户访问该在线社会网络的时间间隔；所述服务器(当然，也可以是所述数据库)设一网页评分模块，用以根据所述时间间隔、该网页被转发次数和该用户已转发该朋友推荐网页的次数对该网页评分，并得出该网页的综合分数；所述服务器设一网页排序模块，根据上述网页的综合分数对各网页进行排序；所述服务器按照网页排序全部或部分将搜索结果返还所述用户终端，以便用户查阅。 In this embodiment, the online social network maintains a web popularity of the database (expressed as <webpage, popularity> database to record the page is forwarded frequency and maintenance of the database the number one has been forwarded friend page, (expressed as < number> users, friends, friend has forwarded pages database), online social networks also extract each web page a user's friends are forwarded to the user that the user access time interval of the online social network; the server (of course, the database may be) set up a web page scoring module responsive to said time interval, the page number and the user is forwarded to the number of times a friend has been forwarded to the web page of the score, and draw a composite score of the page; the web server is provided a sorting module to sort a composite score for each page according to the above-described web page; the server according to the user terminal returning all or part of the page to sort the search results for the user to view. 1、在线社会网络维护〈网页，流行度> 的数据库，每当产生新网页时，在数据库插入该网页的记录，将流行度设置为I。  1, an online social network maintenance <page popularity> database whenever a new web page, insert records in a database that page, the popularity is set to I. 每当用户转发该网页时，在数据库更新该网页的记录，将流行度加I。 Whenever a user forwards the page to update records in a database that page, plus the popularity I. 2、在线社会网络维护〈用户，朋友，已转发给朋友推荐网页的次数> 的数据库，每当用户创建新的朋友关系时，在数据库插入该朋友的记录，并将已转发该朋友推荐网页的数量设置为O。  2, the online social network maintenance <user, friend, the number has been forwarded to a friend recommended the page> database whenever a user creates a new relationship between friends, the friends of the records in the database insertion, and was forwarded to the friend set the recommended number of pages is O. 每当用户转发该朋友推荐的网页时，将已转发该朋友推荐网页的数量加I。 The number whenever the user forwards the pages recommended by a friend, the friend recommendation was forwarded to the web page plus I. 3、当用户登录系统时，在线社会网络首先获取所有朋友推荐的网页，表示为〈推荐朋友，推荐时间，推荐的网页〉。  3, when the user logs in the system, the online social network first to get all recommended by a friend page, expressed as <refer a friend, recommended time, recommended page>. 4、对于每个网页，查询〈网页，流行度〉的数据库，获得网页的流行度。  4, for each page, query <page popularity> database to obtain popularity of the page. 对于推荐朋友，访问〈用户，朋友，已转发给朋友推荐网页的次数〉的数据库，获得已转发给朋友推荐网页的数量。 For a friend's recommendation, visit <user, friend, friend has been forwarded to the number of pages> database, access has been forwarded to the number of friends recommended the page. 5、对于每个网页，按照公式(I)计算网页自身分数Pscorek ;按照公式(2)计算网页的时间分数iScorek ;按照公式(3)计算朋友对用户的分数ascorey。  5, for each page, in accordance with the formula (I) score is calculated on the page itself Pscorek; according to Equation (2) calculation of the fraction of time the page iScorek; (3) Friend score calculated according to the formula ascorey user. 6、计算每个网页的总分是pscorefiscorefascoreip 7、对于朋友推荐的所有网页，计算相应的分数，并按照分数排序。  6, the total score is calculated for each page pscorefiscorefascoreip  7, for the friend of all pages corresponding score is calculated, and sorted according to fractions. 得分越高的网页，排在越前面。 The higher the score the web, ahead of the more. 8、向用户返回全部或部分的排序后的网页搜索结果。  8, the search results page to sort all or part of the return to the user. 为了方便后续描述，本发明方法简称PIF方法，即the ranking algorithm basedon popularity, interval time and previous adoption from the friend。  For convenience of subsequent description, the method of the present invention is a method referred to as PIF, i.e., the ranking algorithm basedon popularity, interval time and previous adoption from the friend. 以下详细介绍模拟实验，验证本发明方法的效果。  The following detailed description simulation experiment to test the effect of the method of the present invention. 该实验使用人人网，这是中国最大、最早的在线社会网络之一。 The experiment uses all networks, which is one of China's largest and oldest online social networks. 本发明利用用户分享信息及朋友关系，对网页排序结果进行评测。 The present invention utilizes users to share information with friends and relations, to sort the results pages for evaluation. 1、收集4211万用户的朋友关系，和2010年7月前所有的分享网页记录。  1, collected 42.11 million users of friendship, and all share web history in July 2010 ago. 2、随机抽取I万用户，作为评测用户集。  2, I randomly million users, as the current user reviews. 自2010年I月I日到2010年6月，这些用户的朋友推荐的网页，作为评测网页集。 Since January 2010 I I May to June 2010, these users are recommended by a friend page, as evaluation page set. 3、基于用户分享网页记录，本发明对评测网页集建立〈网页，流行度> 的数据库。  3, based on the user share pages recording, the present invention establishes <page, popularity> evaluation of database page set. 4、基于用户分享网页记录，本发明对评测用户集建立〈用户，朋友，已转发给朋友推荐网页的数量〉的数据库。  4, based on the user to share web history, the present invention is to establish a set of evaluation user <user, friend, friend has been forwarded to the number of pages> database. 5、每当用户采纳、转发朋友推荐的网页时，获取当前时刻朋友推荐的网页，并按照本发明方法进行排序。  5, every user adoption, when a friend forwarded the page to get the current time friend page, sorted according to the method of the invention. 6、评估排序效果。  6, evaluate the effect of the sort. 对于用户实际采纳、转发的网页，计算在排序结果的位置。 For the actual user adoption, forward pages to calculate the position in the sort of results. 如果位置越靠前，则效果越好。 If the position of the front, the better the effect. 7、比较排序效果。  7, compare sort results. 本实验同时考虑下述3种方法，计算基于该方法的排序结果，并求出实际转发网页的位置。 This experiment taking into account the following three methods, based on a sorting result of the calculation process, and calculates the actual location of the page forward. I)基于流行度的方法，简称P方法(Popularity)。  I) a method based on popularity, a method referred to as P (Popularity). 网页的流行度越高，排在越前面。 The higher the popularity of a web page, ahead of Vietnam. 2)基于转发时间间隔的方法，简称IT方法(Interval Time)。  2) time interval-based forwarding method, the method is abbreviated as IT (Interval Time). 网页的转发间隔时间越短，排在越前面。 Forwarding the page interval shorter in front of the row. 这是人人网等在线社会网络主要使用的方法。 This is the way all network and other online social networks are mainly used. 3)基于已转发朋友推荐网页数量的方法,简称FI方法(Previous adoption fromthe friend) 0已转发该朋友推荐网页数量越多，这位朋友新推荐的网页排名越靠前。  3) based method has been forwarded friend recommended number of pages, referred FI method (Previous adoption fromthe friend) 0 has forwarded the greater the number of pages a friend, the friend recommended a new page more high ranking. 图4给出了在线社会网络排序方法PIF的实施效果的优越性。  Figure 4 shows the effect of the superiority of an online social network embodiment sorted by the PIF. 如图4所示，比较了在各种方法下，用户实际采纳、转发网页的排名。 4, a comparison in a variety of methods, the user actually adopted, forwarding the page ranking. 横轴是排名，纵轴是该排名的网页比例。 The horizontal axis is ranked, the vertical axis is the ratio of the web page ranking. 用户实际转发的网页，必然是用户关注的内容。 The actual forwarding user pages must be the contents of the user's attention. 这些网页的排名越靠前，表明方法的效果越好。 More front rank of these pages, the better the results show that our method. 从图4中可以看出，本发明的在线社会网络网页搜索PIF方法效果最佳，40%的网页都排在前10，明显优于其它方法。 As can be seen from Figure 4, an online social network web search method PIF best effect of the invention, the top 40% of the 10 pages are obviously superior to other methods. 本发明方法可以帮助用户得到关注的网页，避免信息过载等问题。 Method  The present invention can help users get the page of interest, to avoid information overload problem. 1.一种在线社会网络的网页搜索方法，其步骤包括: 1)在用户访问在线社会网络时，在线社会网络搜索所有该用户的朋友推荐给该用户的网页； 2)对上述搜索到的各网页，在线社会网络提取该朋友转发该网页至该用户当前访问的时间间隔、被转发的次数和该用户已转发该朋友推荐网页的数量； 3)在线社会网络根据各网页的上述时间间隔、被转发的次数和该用户已转发该朋友推荐网页的数量作为参数对各网页进行排序； 4)在线社会网络按照上述排序向用户返回全部或部分搜索结果； 根据上述时间间隔、被转发次数和该用户已转发该朋友推荐网页的数量分别对各网页评分，并得到各网页的综合分数，按照综合分数对各网页进行排序； 上述网页根据时间间隔的分数为: isaarak = 14.74 * ^嫌-*。 1. A method of web search online social network, comprising the steps of: 1) when the user access to online social networks, online social networks to search for all of the user's friend to the user's page; 2) to each of the above search website, online social network extraction time the friend forwards the page to the user's current access interval, the number to be forwarded and the number of users of the friend webpage has been forwarded; 3) online social networks interval from the time of each page, be the number of forwarding number and the user has forwarded the friend webpage as a parameter to sort each page; 4) online social network to return all or part of the search results to the user in accordance with the above sort; based on the time interval, the number of transfer times and the user the number was forwarded to the friend of each page of each score page and get overall score of each page, sorted according to overall score for each page; pages based on the above-mentioned time interval score is: isaarak = 14.74 * ^ too - *. m-.為(c-tik)/86400〈=30 ;其中，。 . As M- (c-tik) / 86400 <= 30; wherein. 表示当前访问时间，tik表示朋友i转发网页k的时间； 上述网页根据时间间隔的分数为:iscorek=0,当(c_tik)/86400>30 ; 上述网页根据被转发次数的分数为Pscorek=1gltl(Pk),其中，pk表示网页k被转发次数； 上述网页根据该用户已转发该朋友推荐网页的数量的分数为Bscoreij=SS.63+2.其中Sij表示该用户j已转发该朋友i推荐网页的数量； 上述网页的综合分数为pscorek*iScorej^ascoreij。 Represents the current access time, tik denotes friends i forwarded page k of time; and the page based on fractional time interval is: iscorek = 0, when (c_tik) / 86400> 30; these pages according to the scores are forwarded number is Pscorek = 1gltl ( Pk), where, pk represents the k is forwarded page number; above was forwarded to the web page number of a friend fraction Bscoreij = SS.63 + 2 where Sij according to the user indicating that the user was forwarded to the friends i j recommend web number; overall score above page is pscorek * iScorej ^ ascoreij. 2.一种在线社会网络的网页搜索系统，该系统包括: 1)用于使得在用户访问在线社会网络时，在线社会网络搜索所有该用户的朋友推荐给该用户的网页的模块； 2)用于使得对上述搜索到的各网页，在线社会网络提取该朋友转发该网页至该用户当前访问的时间间隔、被转发的次数和该用户已转发该朋友推荐网页的数量的模块； 3)用于使得在线社会网络根据各网页的上述时间间隔、被转发的次数和该用户已转发该朋友推荐网页的数量作为参数对各网页进行排序的模块； 4)用于使得在线社会网络按照上述排序向用户返回全部或部分搜索结果的模块；根据上述时间间隔、被转发次数和该用户已转发该朋友推荐网页的数量分别对各网页评分，并得到各网页的综合分数，按照综合分数对各网页进行排序； 上述网页根据时间间隔的分数为: Iscorek = 14,74*^64"^2.5», ^ (c-t An online social network web search system, which includes: 1) is used so that when users access online social networks, online social networks to search for all of the user's friends to recommend to the page of the user module; 2) to make each page above the search to online social networks to extract the friend forwards the page to the user's current access time interval, the number of times the user is forwarded and the number of modules of the friend webpage has been forwarded; 3) for an online social network such that each page based on the time interval, and the number of times the user is forwarded to the number of the friend has been forwarded as a parameter page to each page of the sorting module; 4) for causing an online social network to a user according to the above ordering return all or part of the module search results; according to the above-mentioned period, the number of transfer times and the user has forwarded the number of the friend webpage are on each page score, and get the overall score of each page, sort each page in accordance with the overall score ; fractional time interval according to the above page is: Iscorek = 14,74 * ^ 64 "^ 2.5», ^ (ct ik)/86400〈=30 ;其中，c 表示当前访问时间，tik表示朋友i转发网页k的时间； 上述网页根据时间间隔的分数为:iscorek=0,当(c_tik)/86400>30 ; 上述网页根据网页被转发次数的分数为: Pscorek=1gltl(Pk),其中，pk表示网页k被转发次数； 上述网页根据该用户已转发该朋友推荐网页的数量的分数为Bscoreij=SS.63+2.其中Sij表示该用户j已转发该朋友i推荐网页的数量；上述网页的综合分数为pscorek*iScorej^ascoreij。 ik) / 86400 <= 30; wherein, c denotes the current access time, tik denotes friends i forwarded page k of time; and the page based on fractional time interval is: iscorek = 0, when (c_tik) / 86400> 30; these pages the score is the number of times the web page is forwarded: Pscorek = 1gltl (Pk), where, pk represents the k is forwarded page number; and the web was forwarded to the page number of a friend fraction Bscoreij = SS.63 + 2 according to the user. where Sij represents the number of user j i recommend the friend webpage has been forwarded; composite score above page is pscorek * iScorej ^ ascoreij.